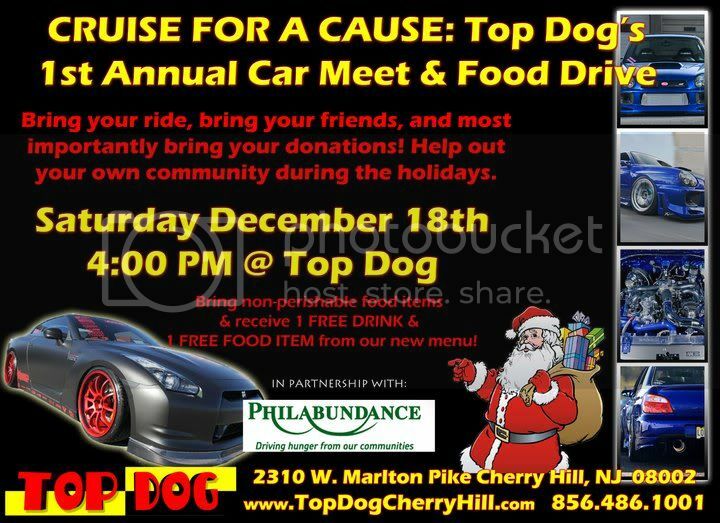 Come out on Dec. 18th at 4pm to Top Dog in Cherry Hill. Bring your car and hang out with your friends all while supporting a good cause. Top Dog will be donating all food items to Philabundance which helps families in need during the holiday season. 1 Free Drink (of your choice) if you bring in ONE non-perishable food item. Bring in TWO or more items and receive 1 Free Drink & 1 Free Food Item off of our new menu! Bring your cars out 1 last time before the snow arrives, come hang out with your friends, and support a great local cause. Car Clubs wishing to park together must arrive together. We are looking for Vendors/Sponsors for this event! Please contact Chris Cepa to apply! I wanna get a good section of trucks out there!!!! Just added: Awards will be givin out by our sponsors R&B Car Customs stay tuned for more information! bumpp for happening in less then 24 hours! !